Fresh water is a precious commodity when living on a volcanic island in the middle of the Pacific Ocean. On the island of Hawaii there are 40,000 – 70,000 households using catchment systems for their water needs. When it rains, water is collected from the roof and gravity-fed into the holding tank beneath the main level of the house. Before water enters the tank it passes through a simple nylon filter. Next, the water pump sends pressurized water into the house. 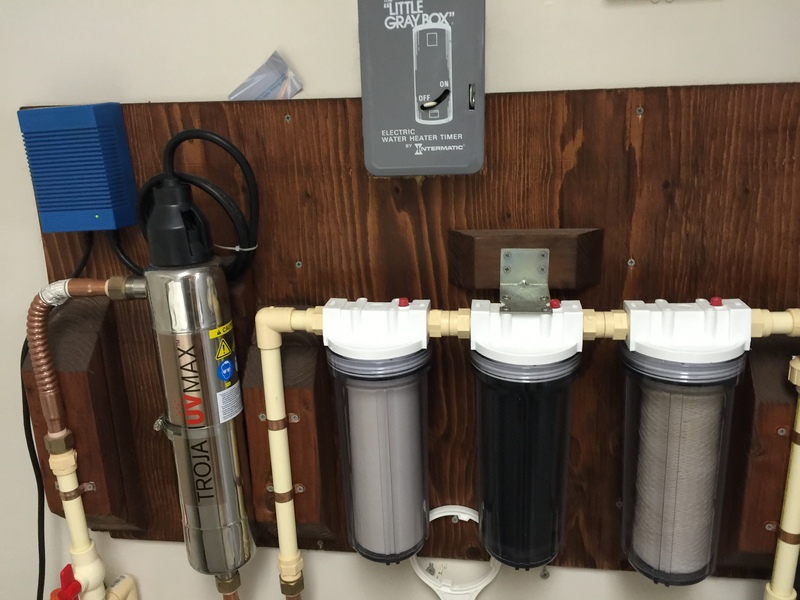 Our pump and filtration system are located in the laundry room. The water is filtered four times before it comes out the tap, first with coarse filters, then ceramic filters to remove microorganisms, and finally with UV filtration to sanitize the water. We use no harmful chemicals. Monthly we have our system checked and treated by a professional, ensuring that our water meets all quality control standards. The water pressure can fluctuate depending upon the demand being placed on the pump to replenish water. When you take a shower, please make sure you are not running the dishwasher or washing machine at the same time. We want to make your stay at Hale a Kimo Kali an enjoyable one and hope that this information about our water system has been helpful to you.